Rabbit anti-human MRE11A antibody recognizes double-strand break repair protein MRE11A, also known as AT-like disease, DNA recombination and repair protein, MRE11 homolog 1, MRE11 homolog A, or endo/exonuclease Mre11. Rabbit anti Human MRE11 antibody recognizes the double-strand break repair protein MRE11, also known as AT-like disease, DNA recombination and repair protein, MRE11 homolog 1, MRE11 homolog A, endo/exonuclease Mre11, meiotic recombination 11 homolog 1 or meiotic recombination 11 homolog A.
MRE11A gene encodes a nuclear protein involved in homologous recombination, telomere length maintenance, and DNA double-strand break repair. By itself, the protein has 3' to 5' exonuclease activity and endonuclease activity. The protein forms a complex with the RAD50 homolog; this complex is required for nonhomologous joining of DNA ends and possesses increased single-stranded DNA endonuclease and 3' to 5' exonuclease activities. In conjunction with a DNA ligase, this protein promotes the joining of noncomplementary ends in vitro using short homologies near the ends of the DNA fragments. Mutations in the MRE11A gene causes Ataxia-telangiectasia-like disorder 1 (ATLD1), a rare disorder characterized by progressive cerebellar ataxia, dysarthria, abnormal eye movements, and absence of telangiectasia (Stewart et al. 1999). MRE11A has a pseudogene on chromosome 3. Alternative splicing of MRE11A results in two transcript variants encoding different isoforms (provided by RefSeq, Jul 2008). 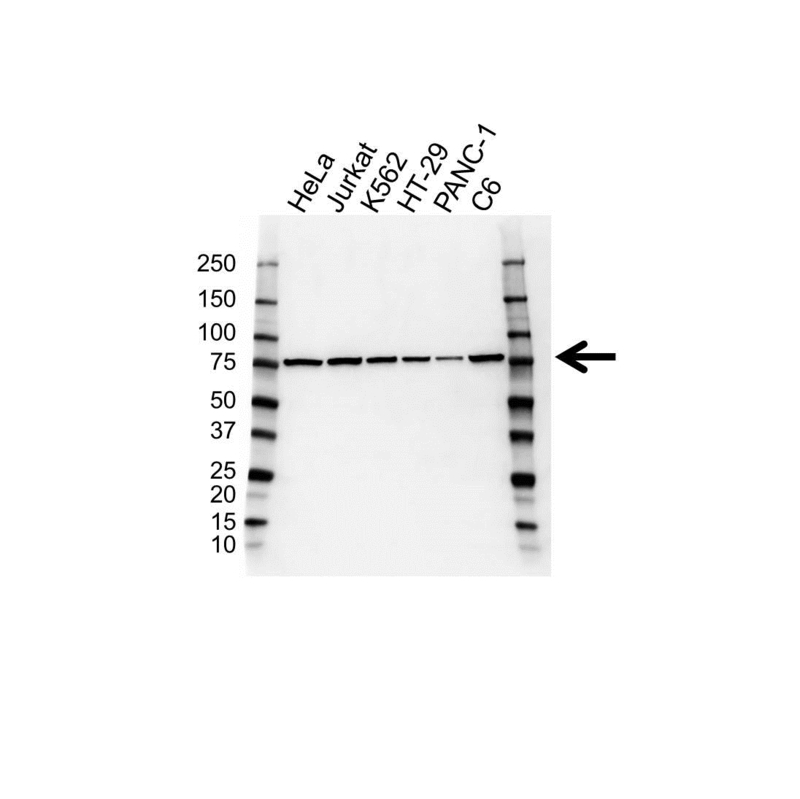 Rabbit anti Human MRE11 antibody detects a band of 81 kDa. The antibody has been extensively validated for western blotting using whole cell lysates. Anti MRE11 detects a band of approximately 81 kDa in HeLa cell lysates.